You two look good … open casket good. This star-bellied sneetch’s name is Torx. The Kev and I have a humongous supply of old fasteners. Many are leftovers from other projects, or older screws that we’ve removed and kept. Kev has a jar-based screw storage system that serves us well and allows us to easily find just the right size for the project at hand. I’m pretty careful about using the right type of screw — I can’t bring myself to use a star-headed screw to attach an original cabinet latch. Thing is, we might have the right size and type of screw, but the finish might be all wrong. 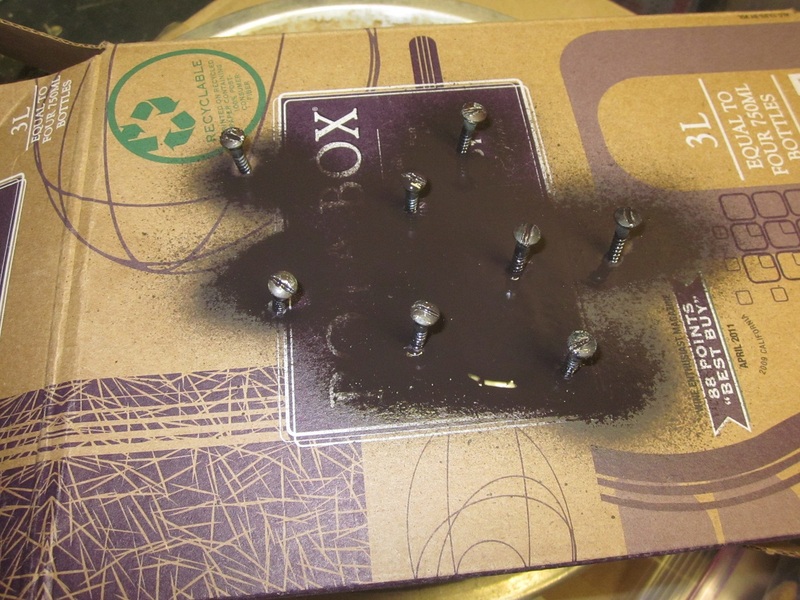 Fortunately, faking the finish on a screw head can be as easy as fingerpaint. Used to be, I’d daub the would-be fastener with bronze paint by hand. Literally. I wish I could get in the habit of wearing my dang gloves! Thanks to House of Hepworths, though, it’s even easier AND my hands don’t even get dirty! I found Allison’s post on making curtain rods (which, by the way, is an awesome tutorial, and one I modified for available materials — will post it at some point). ANYHOO, HoH pointed out that if you stick the screws into styrofoam, you can paint those puppies with reckless abandon, and they don’t stick to stuff while drying. Thick cardboard works too, especially wine boxes! Boxed wine: it just gives and gives! These are the screws from my slow cooked hardware — right finish, but that old paint sinks down into the slots most inconveniently. A little spray paint covers that right up and shines them up a bit. Thanks, Allison! This entry was posted in Before & After, Decor, Repair & Maintenance, Salvage and tagged vintage hardware. Bookmark the permalink.